Just a couple words that describe how I feel this week about getting back into our family’s routine of school and work. Don’t get me wrong, the holidays were wonderful and I felt like we enjoyed a much-needed break. That said, by New Year’s we were starting to climb the walls and fight about every little thing. There were some awesome, memorable “Mom” moments in the last two weeks for sure. 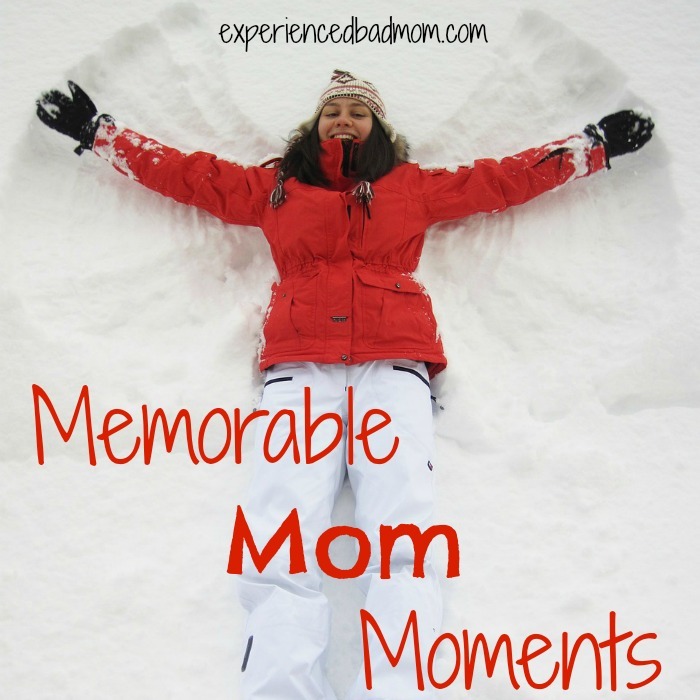 A “Mom” moment is something that you can only appreciate when you’re a mom. It’s a moment that is either sweet or crazy, a brief snapshot of the pleasure – or torture! – it is to be a mom. 8yo: I thought a honeymoon was when you took a ride on a giant bee. 11yo: And I thought a honeymoon was when you took a trip to the moon. 3. Watching Buying Alaska with my son, age 11. Who knew that watching people purchase homes with outhouses and bear-proof windows could encourage mother-tween bonding? 4. Making Christmas cookies and, yes, once again having to finish frosting all 841 of them by myself because the kids grew bored and wandered back over to the TV. 5. Listening to my dearest friend, a judge (not kidding! ), tell me about how she assigned her kids “brain work” every day over Winter Break (also not kidding!) while I let my kids watch a lot of TV. 6. Running to the Dollar Store on Christmas Eve for a last minute item and being told by the kids to stand at the front of the store so they could pick out gifts for me and my husband. They purchased the gifts for us with their own money, too. 7. Watching my kids’ eyes light up when I booked the right friend for a playdate/hang out. Their eyes used to light up like that whenever they saw me when they were babies. 8. Sitting in a hot tub with the kids on a Monday afternoon feeling so blessed to have a job where I get the week off between Christmas and New Year. With pay. 9. 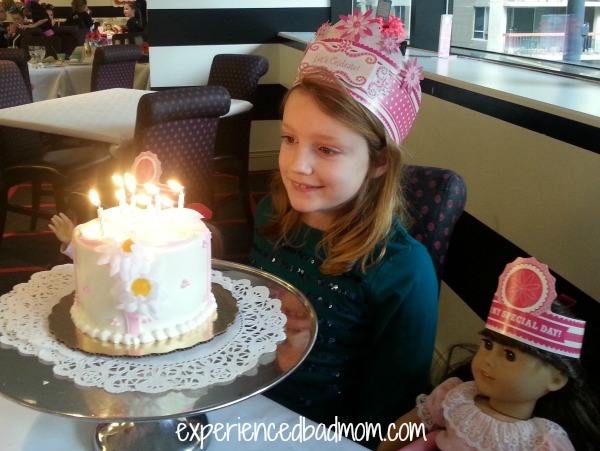 Taking my daughter to American Girl Place in Chicago for the first time and celebrating her recent birthday with lunch at the cafe. We had a great time! And, don’t worry about big brother – he enjoyed the Lego store next door. How were your holidays? Any great “Mom” memories to share? Great moments and memories for sure! Happy New Year! Awww I remember buying a present for my mom at the Dollar Store in Hawaii one year. I didn’t have enough money and the man in line in front of me paid the balance. So kind and something I never forgot. Finally paid it forward two years ago in a San Francisco ice-cream shop. I had many, many memorable moments this Christmas. Chief among them? My 19 year old son thanking me for “doing such a splendid job raising him and his sister,” Wow. Still tear up over that one. Of course, the memorable moments also included lots of bickering between him and his 21 year old sister. Some things never change. I think my most memorable mom moment over the holiday occurred when my baby turned 8 weeks old and I realized she was following my husband and I with her eyes. It felt like she was really “seeing” us for the first time, and it was just so rewarding! Congratulations on your baby! And that is such a memorable time. So many more cool milestones to come! YEAH- great to have the kids back in school and the hubs at work. This was my son’s first year grasping the Santa Claus concept, and the look of awe on his face when he came downstairs Christmas morning and saw that Santa had eaten the cookies he left him—not to mention all the presents!—was priceless. The honeymoon comment is hysterical…out of the mouths of babes! Aw, that is awesome! Both that he got accepted and that he called you. Love it, and thanks for sharing. Fantastic mom moments. I love the honeymoon conversation and that looks like a heavenly cake and Lego store trip. That was an awesome break, Katy! I need to find me a hot tub, I’ve already got that week off!